Kendra Scott "Wesley" statement earrings. Blush mother-of-pearl, abalone shell, or ivory-color mother-of-pearl. 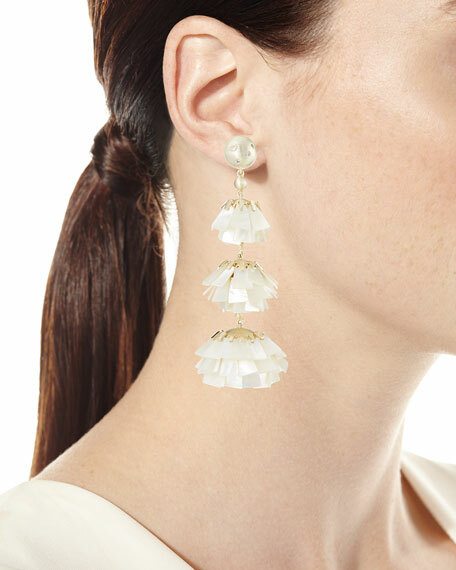 Aria triple-drop earrings by Kendra Scott. Your choice of metal plating over brass. 14-karat gold plating or navy gunmetal plating. Aria triple-drop earrings by Kendra Scott. Your choice of metal plating over brass. 14-karat gold plating or navy gunmetal plating. Dichroic glass drops with crystal edges. Clip-on backs. Imported. Please note: Due to the one-of-a-kind nature of the medium, exact color patterns may vary slightly from the image shown. Jasper drop earrings by Kendra Scott. 14-karat gold plating over brass hardware. 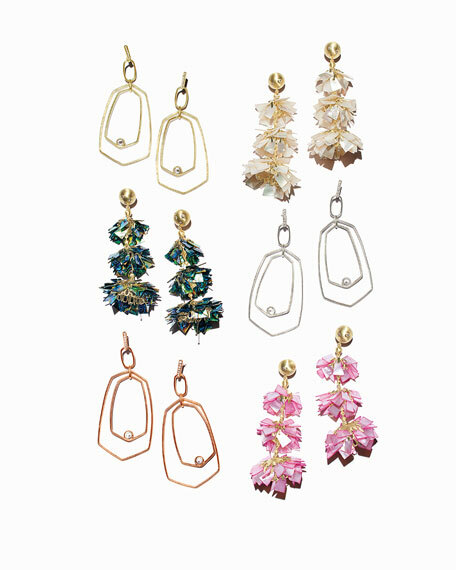 Your choice of posts with multihued acrylic dangles.